6 Small & Mid Cap Stocks You Can't Afford to Miss! The ongoing market turmoil is one of the rare opportunity to get quality stocks at bargain prices. Remember, such opportunities do not last for long! Since beginning of 2018, we have seen severe correction in broader indices. As on date, BSE Small Cap & BSE Mid Cap Index is down by 28.0% & 17.9% respectively from their all time high made in January this year. Steep fall in broader indices have hurt sentiments and created panic for many of retail investors who got into market last year or during this year. Its important to know, whether you would be able to hold on your equity investments, think to exit if stock market tanks further or accumulate good companies available at reasonable to attractive valuations after a long time. Start building your equity portfolio by making educated investment decisions, subscribe to our Hidden Gems, Value Picks, Wealth-Builder annual subscription services. 2. Value Picks (Mid Caps with Plenty of Upside Potential): Our equity analysts team consider Warren Buffet approach to short list stocks from mid cap segment as Value Picks. Market cap of Value Pick will range from 1000 crores to 10,000 crores. Holding period of Value Picks is 12 - 24 months and one can expect returns of 40-60%. 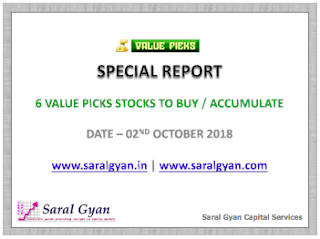 Annual subscription charge of Value Picks is INR 6,000 under which you will receive total 12 Value Picks research reports (one on monthly basis). Click here to read more about Value Picks. 4. Wealth-Builder (An Offline Portfolio Management Service): Wealth-Builder is our model portfolio of Rs. 10 lakhs and currently we are holding 15 stocks in our portfolio. We suggest higher allocation in our Wealth-Builder stocks which includes best of our Hidden Gems and Value Picks released during last couple of years. Our team suggest all our Wealth-Builder members to invest in the stocks which are part of our Wealth-Builder portfolio. Every month our team updates our Wealth-Builder members which stocks they need to buy / sell / hold with % allocation of these stocks in their portfolio, the suggested changes need to be replicated in the same proportion. Annual subscription charge of Wealth-Builder is INR 20,000 under which you will receive total 12-18 portfolio updates. We also review existing equity portfolio of our members and advise them which stocks to hold and which to exit based of fundamental analysis under Wealth-Builder service. Our Wealth-Builder service is suitable for those investors who have an existing portfolio of at least 2 to 3 lakhs or planning to invest similar amount or more in equity market. Click here to read more about Wealth-Builder. To know more about our subscription services and discounts available on our combo packs, click here!